Lesson 3 introduced you to an app named W2A and showed you how to build this app. Now that youâ€™ve learned to create and launch an AVD, Lesson 6 shows you how to install and run W2A on this device. Note: You will have to include the path to adb in the command line if you havenâ€™t added the android- sdkplatform-tools directory to your PATH environment variable. Click the home screenâ€™s app launcher icon (the rectangular grid icon) and select the W2A icon, which is shown in Figure 18. 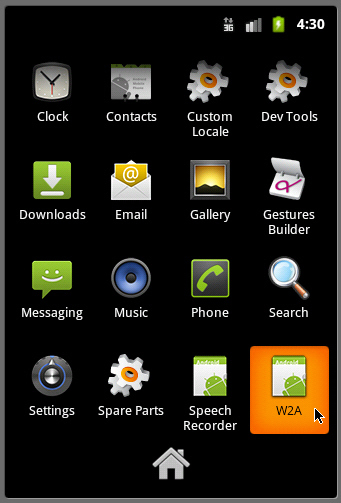 Figure 18: W2A is the highlighted entry on the app launcher screen. Click the W2A icon to launch this app. You should see the screen whose upper portion is shown in Figure 19. Figure 19: Android sends you a greeting. When you finish looking at this app, press the Esc key or click the BACK button in the phone controls to return to the app launcher screen, from where you can explore and play with the deviceâ€™s preinstalled apps. What tool do you use to install W2Aâ€™s APK on the emulated device? How do you run W2A?